This new and necessary take on an American institution-in-transition brings together a journalistic approach with visually impactful formal-materialist experimentation to expressively remediate and deconstruct the sources of football’s contemporary mythology. Adopting tactics and highlighting perspectives that counter football’s romanticization, Ghosts of Empire enacts an experiential anti-myth of this popular tradition. Unlike other pieces on the topic that reproduce the game as a brutal, noble spectacle, this film lays bare the violence of football: its origins, representation, and real-world consequences today. Ghosts of Empire investigates the future of football through an audiovisual comparison and contrasting of its mythologized past and its troubled and troubling present. The mode is exploratory, contemplative, and wide-ranging. 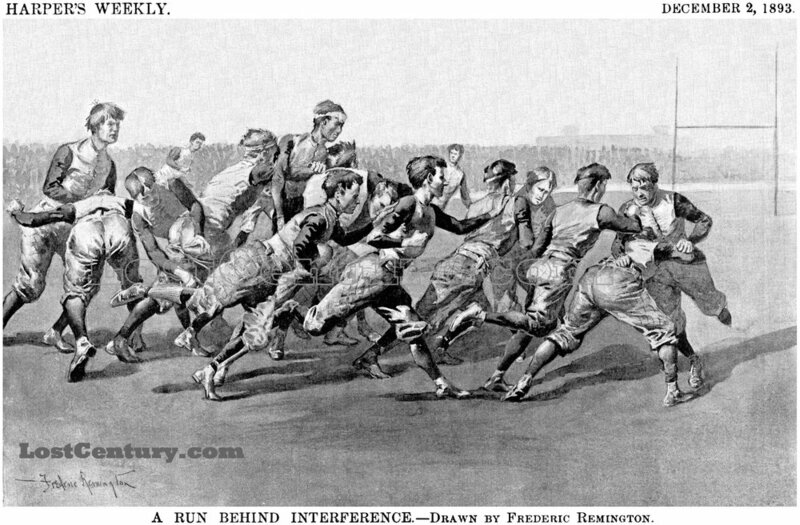 It apposes the NFL’s heavily edited, multi-camera display with unadorned firsthand documentary images of football played at the grassroots level, out of “love for the game” and/or socioeconomic aspiration. These two visions of an ingrained American ritual are now in conflict. Concussions and Chronic Traumatic Encephalopathy (CTE), the brain disease linked to repetitive head trauma, have widened the gap between participation and consumption. To put the current situation into context, the film opens with a historical overview of football and its representation in mainstream culture, conveyed through archival collage. This representation reached an aesthetic and rhetorical highpoint in the work of NFL Films (est. 1965). Part two takes a close look at the development of the NFL as a popular entertainment through the lens of NFL Films. The section offers a close study of the company’s signature visual and aural mechanisms – slow motion, multi-camera filming on 16mm, montage editing, authoritative voiceover, and orchestral music – which blurred the boundaries of action and narration. This study of NFL Films’ practices and techniques is counterpointed with newly gathered testimonies of former players. By integrating these two elements, the film shifts emphasis from the uniform institutional voice of the National Football League to a quilt-like collective voice of the players. Adding to the stakes of the film is the NFL’s new rule demanding that players stand for the performance of the national anthem before games. This rule continues the intensification of the performance of on-field patriotism post 9/11 and contributes to the league’s silencing of Black men and their protest of racist state violence, by a white-controlled industry that capitalizes on racialized Black bodies. The final part of the film moves to the high school fields of today, and spotlights the next generation of footballers as they grapple with their joy of the game, the concerns of their parents, and their knowledge of the dangers that this American tradition and institution poses to their mental and physical wellbeing. Ghosts of Empire charts a trajectory of football as pastime to spectacle, ending with a reflection on how shrinking participation at the amateur level, in tandem with the NFL’s declining TV ratings, threatens to undo football’s power as a national myth. Ghosts of Empire contributes to the crucial discussions about how concussions are evaluated, bringing greater recognition and understanding of the significance and severity of football’s effect on its participants at every level. It also addresses the social, economic, racial, and cultural factors that contribute to the tools and protocols that are made for and used in sports-related brain injury assessment (such as expensive proprietary software). By scrutinizing the way that football has been promoted and aestheticized as a mass media form, and the ideology produced therein, this film offers a closer look at how racial inequity, class dominance, and patriarchal masculinity are mutually constitutive in football culture. These intersecting factors are central to the questions we will be posing to the young men who desire to play. What do teenaged boys think football is, and what are the sources of its appeal? Is there something that football provides that nothing else does? What impression has Colin Kaepernick’s protest, and the movement it engendered, had on today’s young players?